A beautiful native vine or groundcover, if it has nothing to climb on, bears masses of brilliant purple pea type flowers in late Winter to early Spring. Enter the number of plants and click "Add To Cart"
A beautiful native understorey plant with long, broad leaves at the end of slender stems. 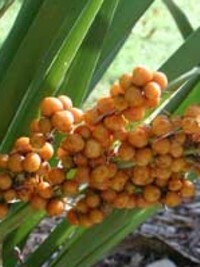 Has a weeping habit and gives a protected, shady area a very tropical type appearance. Bears clusters of red fruits which are attractive to native birds, over a number of months. Grows to 3m high. Beautiful, fine-leafed Palm Lily with bluish coloured flowers and dark red fruits. All the palm lilies give a lush, jungle type appearance to any garden or understorey planting. Grows 3 to 4 metres high. A beautiful, fragrant Native Orchid of the East Coast. Grows naturally in shady forest conditions on rocky surfaces and occasionally on tree logs, but is equally at home in a pot. Flowers profusely in Spring or late Winter in shades of pink. Mid-sized kangaroo paw with beautiful, irridescent-orange flowers for most of the year, to 1.0m high and foliage to 0.6m high. 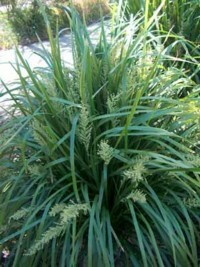 An attractive, clumping grass with bright green foliage. 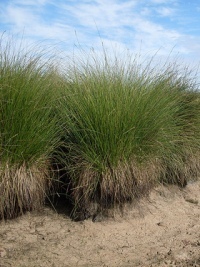 It is a very useful grass in wet areas, around ponds, swamps and even poolsides. 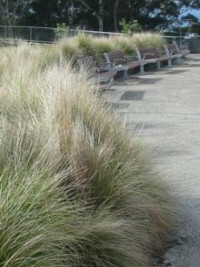 This native grass is used widely for helping remove nutrients from recycled-water ponds and grey water re-use systems. Grows under 1m high. A great border plant in landscaping. Has bright green strap like leaves to 80cm long and 1.5m long blue flower stems in Spring. 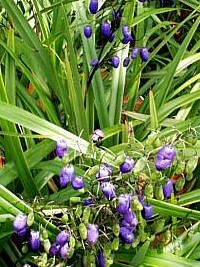 In Summer they are followed by violet berries. A widely used native grass with slender, strap-like., arching leaves. Used in stream stabilisation plantings as well as in many ornamental situations, such as borders. The small flowers are strongly perfumed on warm summer days. Under 1m high.Shade tolerant and Frost resistant. Perfect for garden borders and rockeries. 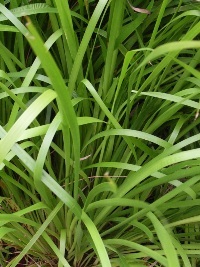 A terrific, small border grass with beautifully narrow, light green leaves. Bears small flowers amongst the foliage. Grows well in full sun to part shade. A very adaptable plant which thrives with minimal care. 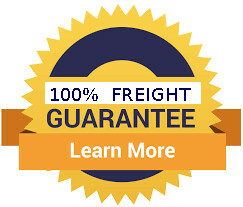 Does well in most soils types, drought, salt and frost tolerant. A widely used native grass with long, strap-like., arching leaves. Used in stream stabilisation plantings as well as in many ornamental situations. The small flowers are strongly perfumed on warm summer days. Under 1m high. Shade tolerant and Frost resistant. A shade tolerant grass like plant with small cream flower spikes followed by bright orange seed capsules. The narrow, strap like leaves are more blue grey than L. hystrix and up to 80cm long and around 1cm wide. A very useful border plant. 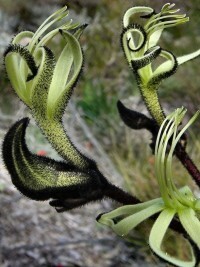 A very desirable and spectacular Kangaroo Paw. 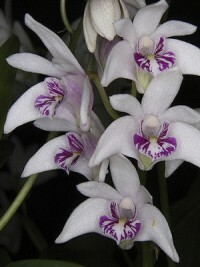 In sub-tropical regions it can be tricky in soil but will thrive for a few years in a container in a sunny position. In dry summer climates it performs best in lighter soils. Foliage consists of blue-green strap-like leaves 20 to 50 cm in height. Flowers in spring and summer on branched stems up to a metre or so high. A dense perennial tussock grass with long, slender, soft, greyish-green or blue-green leaves in a weeping habit. Depending on aspect and soil, it will grow up to 80 cm tall. Delicate plume like flowerheads in spring to summer extend above the foliage up to 1.2 metres. 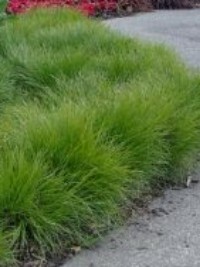 This is a very graceful and attractive grass well suited for Native Landscaping use. A low, spreading shrub with attractive, bright green foliage on arching branches. All new foliage has a brilliant copper-coloured tinge all-year round.Bears mases of white star-shaped flowers in late Spring to Early Summer, followed by edible berries. Grows to half a metre high by 1.5m across. A terrific splash of colour to your native garden for most of the year. Grows into a neat ground covering clump about40cm round. 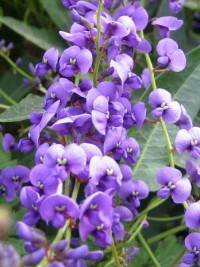 Has lilac / blue flowers and likes a well drained spot. 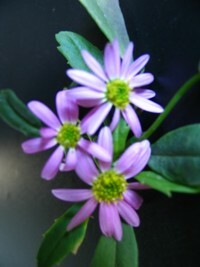 Showy ground cover spreading to 50 cm with dark green divided leaves and constant candy pink daisies occur throughout the year. Frost tolerant..
Beautiful and prolific, spreading, groundcover Goodenia with bright green, fleshy leaves and masses of large, bright yellow flowers from Spring right through Summer. Frost resistant. A hybrid cross between G. juniperina and G. Forest Rambler. 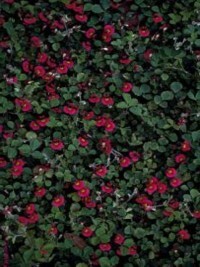 A fast growing and hardy groundcover growing up to 2 m wide. Dense, non prickly foliage and masses of dark red spider flowers over a long period. Frost tolerant and drought tolerant. Beautiful, dense groundcover - similar to G. lanigera Mt Tamboritha - with much smaller, finer foliage and therefore a much denser blanketing effect. Lovely, miniature, dark-red flowers. Frost resistant. 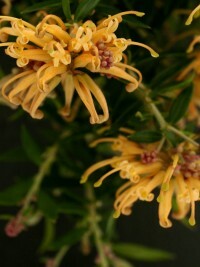 A specially selected hybrid cross between Grevillea junipera and G.rhyolitica it has dense foliage and a sprawling habit, making it a great ground cover. Bears masses of beautiful apricot coloured flowers in Autumn. Height to 0.3m and width up to .75m. A suckering, perennial groundcover with furry, grey leaves and golden yellow globular flowers in clusters, on erect stems,for most of the year.Frost resistant. A showy and very useful groundcover with clover like green leaves and masses of pea shaped red-purple flowers during Spring. An ideal ground cover for a hot dry position. Prefers a sandy gravelly soil in an open or shaded position. Drought and Frost resistant. A very hardy, large leafed groundcover and climber with unusual Black and Yellow flowers. 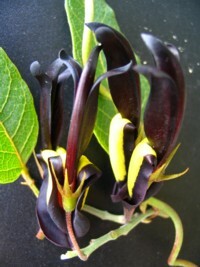 The large leaves are about 10cm long and 7cm wide. This is an extremely vigorous climber that is ideal for covering fences, banks and pergolas quickly. Also use a ground cover where upright plants are absent.